Seed potatoes are available at Argyle Feed Store. We offer Yukon Gold and Red La Soda potatoes. Red Lasoda are a high yielding variety. Resistant to tipburn, and to wind, heat and drought damage. A very early variety that has high tolerance of heat, plants do not wither during heat and drought. Beautiful smooth red skin with pure white flesh. 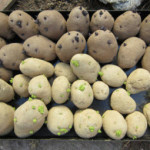 Tubers are oblong and slightly flattened with medium deep eyes. An excellent potato for boiling, it never loses its flavor. Known as the best storing red potato, will keep for months. Yukon gold potatoes are popular. Plant these in your garden and you will have a goldmine of yellow-skinned, yellow-fleshed potatoes ready to harvest in 100 days. Potatoes are perfect for browning or your favorite recipe. This entry was posted on Thursday, January 31st, 2019 at 9:17 pm	and is filed under Garden, News & Updates. You can follow any responses to this entry through the RSS 2.0 feed. Both comments and pings are currently closed.